All trips last 100 minutes. The trips leave from Buffalo River Works located at 359 Ganson Street. We cruise the historic Buffalo River. Free ice, cups and use of cooler are included. Lots of parking and great restrooms. Mon & Tuesday $399.99 (Up to 16 Riders) plus gratuity, traditionally $6.00 a person. Wed & Thursday $459.99 (Up to 16 Riders) plus gratuity, traditionally $6.00 a person. Friday - Sunday $499.99 (Up to 16 Riders) plus gratuity, traditionally $6.00 a person. Let us take you and your guests out to cruise the beautiful Buffalo New York waterfront! Our boats have proven to be the most popular party boats on the water. You and your friends will share an experience that is both fun and relaxing. The boat has a huge bar where your guest seat at that encourages conversation and singing. Yes, we have karaoke on the boats if guests want to sing their favorite songs. We even have a dance floors on the boat. We take tons of pictures to capture your memories for you. You nibble on snacks and sip your favorite canned beverages. We are BYOB, although many guests save time by ordering food and drinks from RiverWorks that they bring on the boat. Order at the link. We provide free cups, ice and a cooler. Trips start and end at RiverWorks, Buffalo premier waterfront and canalside attraction. Before and after the trip, enjoy the wonderful ambiance the unique venue at River Works provides. Relax in style, enjoy some refreshing drinks and eat delicious food on their huge patio. Once the trip starts, we head towards the lake where you will see Buffalo’s iconic grain elevators, wildlife, historic naval ships, the beautiful Buffalo Main Lighthouse, Canalside and Erie Basin Marina. Then we head back past RiverWorks towards Silo City where we take you to see the ghost ship! Relax with your friends, sip your favorite beverage, and listen to the music of your choice on our Bluetooth sound system. Our custom made pedal boat is powered by our guests, just like our road bikes. You do the pedaling and we’ll take care of the steering. You and your group set the pace. In fact, our guests invariably find the pedaling relaxing. Pedaling is easy, but we have a back up motor if you just want to cruise. LET OUR BOAT BE YOUR PARTY SPACE! The boat is your party space. Most tours are booked by one group. Small groups can be combined on certain days, call us for the details. We have a huge awning that will keep you dry when needed. 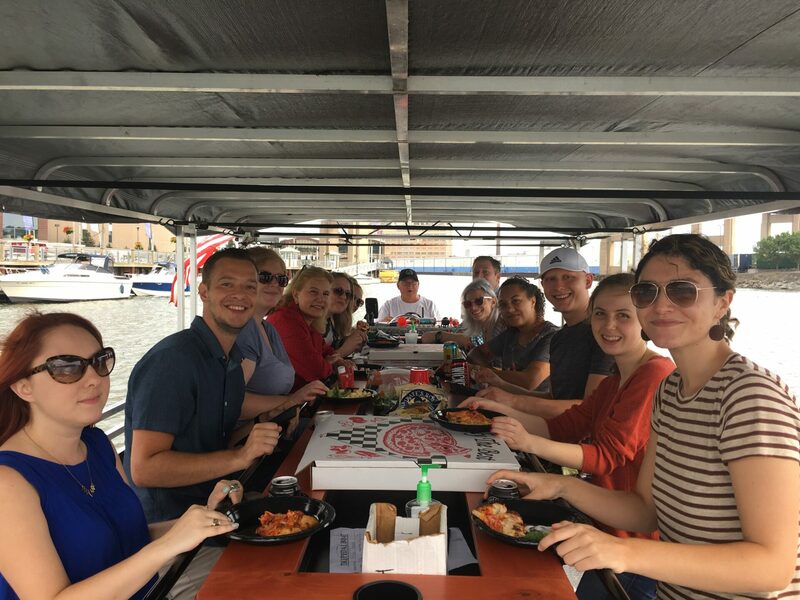 Call us today so we can assist you design your party boat cruise of the Buffalo, NY, waterfront that suits your group’s tastes. The cost for a VIP private 100 minute trip starts at just $439.99 for 16 adults on Mondays and Tuesdays. This includes everything but a tip for the crew. Additional seats are available at $25 each. We provide FREE cups, ice and a cooler to store your drinks. Don’t feel like pedaling? Not a problem! Our powerful 60 HP motor is ready to take over when you just want to cruise around. Former USMC Force Recon Larry Jones is our party boat’s AWESOME Captain. In the winter, when he’s not piloting our boat, he’s deep in the jungles of the Amazon River. Visit our Pedal Boat FAQ page for more info on what to expect and how to prepare!